Troy and Elizabeth Fitzpatrick are my FaceBook friends. Troy was talking about his smoked salmon. Now, I have grilled some salmon but not smoked it. So, Troy asked if I'd like to try out his salmon. He's send out a sample. Now, I like salmon, but I've never really loved salmon (even though I know it's a very healthy fish). Around here, it is usually kind of fishy tasting. It's not awful, but I don't go out looking for it. Troy said this was wild caught salmon and that he cold smoked it. I had visions of fish jerky floating in my head. "Oh no," said Troy. "If that salmon arrives dried out, you let me know. I promise it will be moist." Rather than try to explain cold smoking (which I understand for cheese), Troy called to explain the process and to tell me the differences between the fishy tasting salmon I buy here in central North Carolina and the salmon he gets on the west coast. By this point, I was quite curious to try this special salmon cold smoked. The package arrived, and the salmon looked beautiful and was calling my name. Since I was home alone, I decided to wait until the the next night, so the guys could try it too. Wow. That's just all I can say. It was love at first bite. If you've never had really great salmon, then you are missing out. This salmon did not taste one bit fishy. It was just melt-in-your-mouth fabulous with such a great smoky kick. I posted about Troy's salmon on FaceBook, and everyone was asking what I ate it with. Haha - "A fork!" Seriously. The guys and I shared it as an appetizer. I didn't want to miss any of the flavor. It was just shear salmon heaven. The salmon is all gone. That didn't take long I must say. We were pigs (especially me). And, I've thought a little about cold smoking. That is cost, labor, and time intensive though. I'd need a dedicated set up for cold smoking and would really need to make large batches to make this a good home project. With both boys in college and only in and out, this doesn't seem the best time to take on a new outdoor smoking project and carve out space and time. But . . . Lucky Smoke House has cold smoked salmon which they ship. Troy (or perhaps Stephanie) are world class packers too. They sent their new rubs/seasonings (reviews coming soon) as well as the salmon, and the box was just photo perfect. The salmon was on ice packs and was nicely chilled on arrival and then went in the refrigerator overnight. Please feel free to share your cold smoking techniques, tips, and encouragment. I may bite the bullet on this and go for cold smoking one of these days but not during spring semester. I'd have trouble getting west coast salmon though, and I suspect I'd be disappointed in anything less than Troy's salmon. I must apologize for thinking Troy was sending out some kind of fish jerky (though I do love jerky). This was nothing at all like jerky. It was tender, flaky, and moist, and . . . I'm still dreaming about this salmon (and you guys know I don't usually get all mushy on you). If you've never tried cold smoked salmon, I'd definately recommend it - especially Troy's (as I don't konw if other people would make it so great). I haven't ever cold smoked salmon, only cheese, nuts, and spices. Like you, I have no experience with it. Sounds like Troy knows what they are doing! Yes. I'm sure I could master this technique. 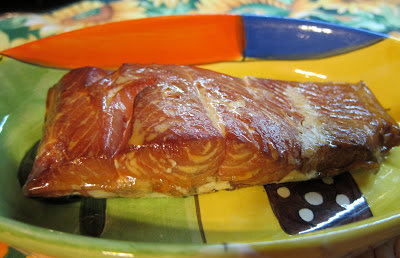 But, it would be hard to get the west coast salmon and a lot of work to set up for cold smoking (unless I did it a lot). This is fabulous smoked salmon though, and Troy does have it mastered for sure. I'll have to keep this on my treat or holiday list. Cold smoked salmon, one of very favorite foods. We love salmon and all smoked foods the combo is a double treat for us. We enjoy your blog and visit frequently please keep up the great work! I have never used this technique to grill salmon and can wait to try it. Salmon always got dry in my grilling experience (although I love salmon)and it sounds like this method is keeping it nice and juicy. Will be back to share my experience.